We all know sales is a numbers game, which is why we prioritize metrics that cater to optimizing those numbers so significantly. However, it’s not enough to simply aim to increase the number of calls your agents make and convert to sales. The reason big numbers matter is because quantity leads to quality. Eventually, your goal is to have a solid foundation of quality leads that generate significant revenue for your company on a consistent basis. 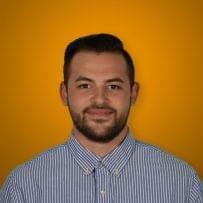 As a sales manager, looking to call tracking metrics is a great way to start prioritizing quality and quantity simultaneously. Here, we’re breaking down ten call tracking metrics that every sales manager should monitor. There are tons of metrics you as a sales manager should be monitoring; however, call metrics hold significant weight over others because phone calls are the primary way agents and leads interact with one another. Those calls also tend to be the first interaction, which means it’s important to monitor what works and what doesn’t early on so potential problems don’t hold up the pipeline. 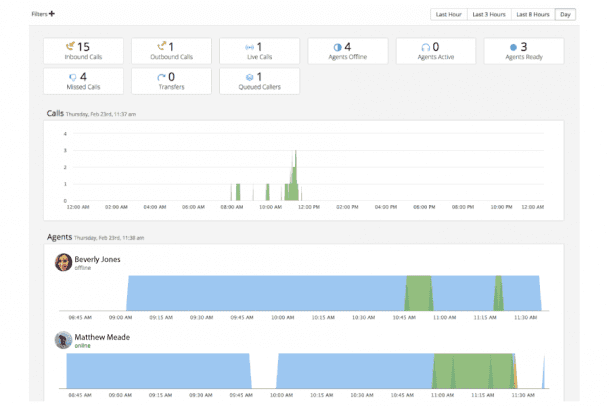 Let’s take a closer look at some of the call metrics that every sales manager should monitor. The first, and probably most obvious metric to monitor, is Calls Made per Hour. As we’ve already said, sales is a numbers game. The more calls your agents make, the more likely they’ll stumble upon qualified leads that can proceed through the sales funnel. Monitoring the number of calls your agents make either as a team or on an individual level is a great starting point to determine if your team is putting in enough of an effort to meet your goals. Or, conversely, you might notice your team is working extremely hard and they aren’t meeting your expectations. This is a great indicator that you might be asking for too much. Whatever the case may be, this metric can be personalized to fit your team. You can monitor the number of calls your agents make per hour on a weekly or monthly basis to determine how consistent they are and what your strong and weak months are. “72% of companies with less than 50 new opps per month didn’t achieve their revenue goals” (Hubspot). This simply means your sales team has to do more to make the strategy work in their favor. Either hire more agents or find a way to increase productivity in the office without going overboard. It’s not enough to just monitor the number of calls your agents are performing over the course of an hour, week, or month. What’s important to monitor is how many of those calls does it take to secure a meeting. You obviously want that number to be as low as possible. That would be a great indicator of your team finding great sources of leads. However, if, for example, you’re seeing a high number of calls needing to take place before landing a meeting, you need to reevaluate where you’re looking for leads. Sales agents can’t work miracles if the leads are bad. It’s your responsibility as a manager to provide your team with the best possible tools to succeed. If you tell them to look left when the answer is to the right, is the agent really to blame? “It takes an average of 18 calls to actually connect with a buyer” (Hubspot). Remind your agents that they can’t give up after the first few calls. If they stick to the strategy, it can work. It also makes sense to monitor the ways and the percentage of calls that lead to a specific outcome. For example, knowing that 20 percent of your calls go to voicemail can be a great indicator that you’re not doing enough to encourage a caller to pick up. 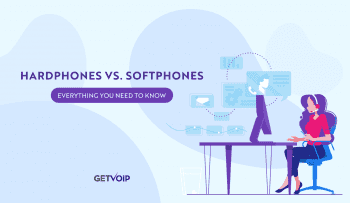 One small change that can make a significant difference is switching to a business VoIP phone system that allows businesses to use a local number. Alternatively, you should also monitor how many of those calls get picked up. Are you finding that 70 percent of cold calls are picked up and then immediately hung up? Perhaps it’s time to train your sales agents on how to introduce themselves in a way that keeps the caller from hanging up the second your agents start their sales pitch. Knowing what happens as a result of your call can clearly make a difference and lead to better optimization of your calling strategy. 80% of sales require five follow-up phone calls after the meeting. (GetCRM). Again, even when a lead shows interest, they’ll be more skeptical than usual because they’re making a purchase they didn’t originally intend on making. Nurture your leads as much as possible. Do your sales agents constantly hear from the other end of the line that “now’s not a good time?” It might make sense to monitor what time of day and what days of the week are best in terms of actually getting a conversation going. If your targeted audience is located on the other side of the world, you can’t call them right after lunch because it’ll be the middle of the night. If you decided that having your agents spend Monday making calls is best, but it turns out leads are more likely to pick up the phone on Wednesday, you have to adjust your strategy to fit the needs of the lead. If you’re trying to acquire new leads and you’re not taking the time of day you call into account, you’re automatically giving off the impression that your needs are more important than theirs. “The best days to call are Wednesdays and Thursdays from 6:45 to 9:00 a.m. and 4:00 to 6:00 p.m.” (GetCRM). This might not fit with your specific company, but you should have a general understanding of when a good and bad time to call is. Are your agents’ efforts actually amounting to anything? As much as you want every single lead to pick up the phone, that will never be the case, meaning agents have to leave a ton of voicemails. If they’re leaving voicemails, but no one is actually returning their calls, that’s a clear indication that either the leads aren’t interested in your product or your agents aren’t doing enough to convince people to call back. One simple trick to increase the already-slim odds is to personalize the message. Instead of jumping right into the pitch, address the caller by their name. Another is to leave an actionable voicemail while providing a direct number or extension to make following up much easier. The easier it is for a caller to determine who you are and what you want, the better the chances of eliminating any guessing games and going right into a meaningful conversation. “The optimal voicemail message is between 8 and 14 seconds” (The Sales Hunter). This means your agents have to offer an actionable message that resonates with that specific caller in order to increase the odds of the lead calling back. The number of follow-ups it takes to reach a lead can also indicate how well your sales team is performing. If it only takes one or two quick follow-ups to reach a lead, it shows that the leads you’re targeting are, at the very least, interested in learning more about your company. If, for example, you’re seeing that it takes your agents five or six follow-ups that amount to little or no potential, it’s time to reevaluate how your business sources leads. Agents who spend time with follow-ups can’t increase the number of calls necessary to put the odds of qualifying a lead in their favor. “44% of salespeople give up after one follow-up” (HubSpot). Like we’ve already mentioned, it’s going to take more than one follow-up to convert a lead. Even if the lead shows interest, agents have to find the time to nurture the lead and close. This is simple but imperative for any sized business interested in optimizing their sales call strategy. Your agents can meet their quota for calls per day, get leads to pick up the phone and stay on the line, and deem them sales qualified, but if those leads aren’t converting, it might be time to reevaluate your pipeline. Sales calls are ideal when it comes to acquiring leads, but they’re also a great indicator of whether or not your pipeline is optimized to its fullest potential. Sales managers have to pay attention to call conversions because they can make or break a sales strategy. Times are changing and people aren’t as committed to using the phone as they used to be. However, there are still tons of people who are, and it wouldn’t be advisable to ignore them. 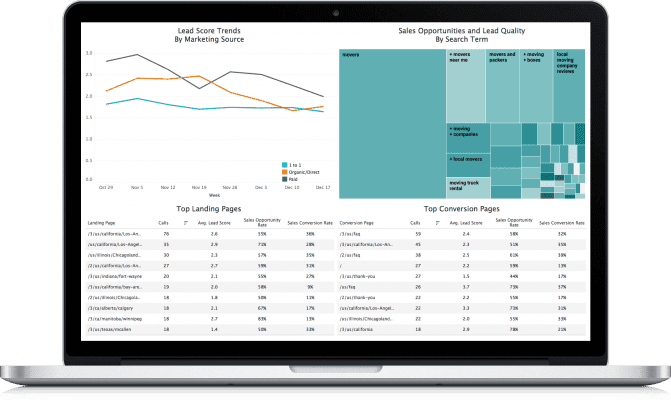 “76% of sales professionals say using sales analytics has significantly or somewhat improved their ability to provide customers with a consistent experience across every channel” (Salesforce). Here’s where we start to cross paths with the marketing team. Marketing teams are often in charge of producing digital content that attracts leads to your business’ website. Landing pages have to be easy to read and actionable in order to convince leads to contact the business for more info. In order to determine whether or not your landing pages are doing their job, it’s imperative to monitor the number of calls your business receives that come directly from your landing page. It’s also good to monitor what the last page a lead sees before making a call is — the active page. If there’s content on there that really inspires a lead to call your business without you or your agents lifting a finger, you should try to reverse engineer that page to see what’s working and try to make that messaging more consistent throughout your website. “Only half (50%) of all landing pages are mobile-optimized” (Adobe). If you’re not taking advantage of mobile, you’re putting your business at a significant disadvantage. Make sure you start from scratch to offer the best user experience. To continue with the same train of thought, it’s important to take number eight a step further by monitoring how long it takes for a lead to view a page on your website and then make a call. You want this number to be as low as possible. The easier it is for a lead to determine who your business is and what they offer, the easier it will be for them to decide whether or not your product/service is right for them. There are many ways to go about decreasing the time spent on a website in a positive way. First, make sure your website has your brand on it. Personalized websites tell the lead that you’re actively working on your website. Second, make sure your content is actionable and relatable to the lead. It shouldn’t take more than a minute or two for the lead to figure out what you’re selling. Third, make sure your business’ contact info is clear, updated, and easy to find. As an added bonus, also be sure your website is optimized for mobile to speed up the calling process even further. “Omnichannel shoppers have a 30% higher lifetime value than those who shop using only one channel” (Google). This is a feature that can be found in many of the top call tracking software available. 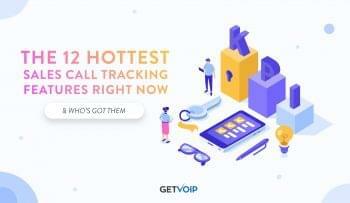 CallRail, for example, offers keyword call tracking, which can be described as such: Businesses can track the number of calls people make to your business based on a keyword they used to find your business. They do this by assigning a phone number to a keyword. Keyword Call Tracking also helps optimize your business’ SEO strategy, which is designed to make your website as visible as possible. If you’re targeting keywords that are too expensive to rank for, keyword call tracking can help your team determine what a better approach is. 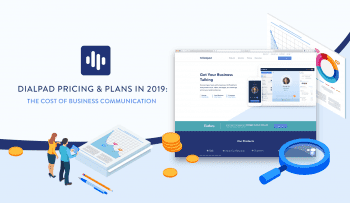 Blending SEO and sales is a great strategy for businesses to take in 2019. By paying attention to the keywords used to reach your company, you can optimize your sales approach to those keywords to ensure you’re offering personalized experiences that matter to your leads and customers. “57% of B2B marketers stated that SEO generates more leads than any other marketing initiative” (Junto). Like we’ve said, sales is a numbers game, and sales relies significantly on marketing to find qualified leads. An effective SEO strategy helps both teams, which can increase conversions over time. Regardless of the channels your business offers, the phone is still one of the most important to prioritize. Sales teams need to increase the number of calls they make to increase the odds ever so slightly in their favor of finding leads qualified enough to enter the pipeline. However, sales isn’t just a numbers game. Any agent will tell you if every time they called a number, the lead picked up the phone and showed any interest in a conversation, it would be a dream come true. 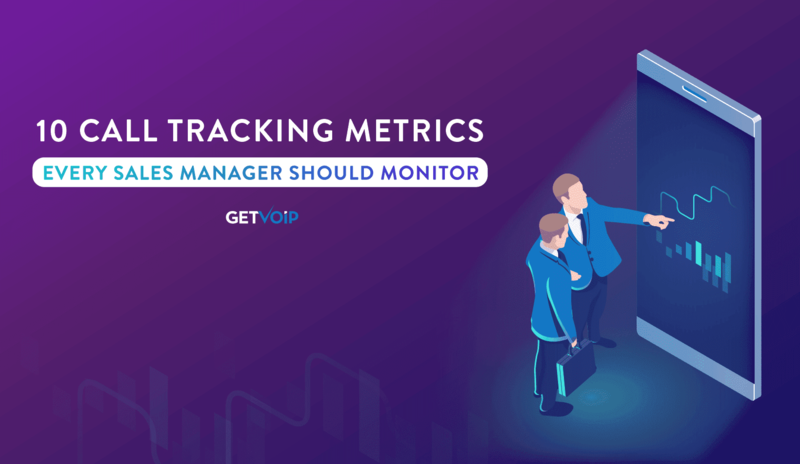 These ten call tracking metrics that every sales manager should monitor are a great start for any team looking to optimize their sales strategy. They all boil down to prioritizing the customer experience and buyer’s journey, which should always be your team’s number one goal.